The WKO Delegation for Southeastern and Central Europe of AUSSENWIRTSCHAFT AUSTRIA visits Axess! AUSSENWIRTSCHAFT AUSTRIA acts a strong partner for the international business of Austrian companies. At the same time, it acts as a networking platform for international exchange. 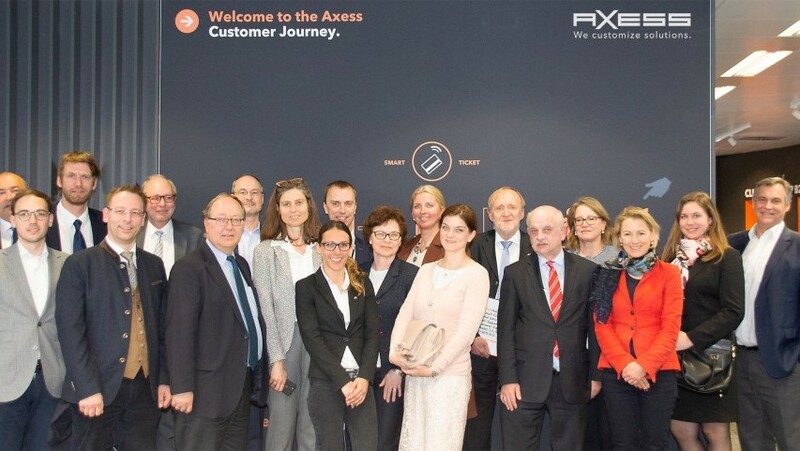 Today, the delegation for Southeastern and Central Europe visited the Axess headquarters. Roundtable discussions about the needs of European markets, new products and possible future positioning in foreign countries took place. A successful exchange, which invited the representatives of the individual countries to learn about the current development of the market and to talk about common offensives for exports. Axess is a strong partner in the Foreign Trade sector, with 85% of sales and production going abroad. With 16 owned branches and several partners worldwide, the product range of the five business areas spans the whole world. Latest Projects, Events, Research & Development activities and News from the World of Axess. The Japanese Alps are Calling! The Japanese Alps are Calling! Axess will appear at the Snow Expo in Yokohama, from the 13th to 15th of February. Axess will be present as part of the showcase AUSSENWIRTSCHAFT AUSTRIA. Join us at the ISPO Alpitec Beijing 2019! Alpitec China is the largest and most important trade show for mountain and winter technologies in the Asia-Pacific region. Axess installs their first UHF Access Solution at Cypress Mountain Resort in Canada. The Boyne Resort Group has tapped Axess to provide their first UHF gate installation, at the Group’s Cypress Mountain Ski Resort near Vancouver. The copyright for all text and picture contributions on this site is held by Axess AG or one of its affiliated companies. The use of material publicized in the Axess web sites is exclusively for private use only; the commercial use in any form or the transfer of data to another medium may only occur with the express permission of a representative from Axess. The printing, copying or downloading of data for private use, as well as journalistic content planned expressly for further publicizing use, are exempt from the above. Please note that, in spite of careful compilation, information appearing in the Axess web site may be incomplete, out-of-date or false. Furthermore, Axess reserves the right to actualize, lengthen, shorten or otherwise adapt or change the contents without prior notice. Making use of the links installed in connection with the axess web site may cause you to leave the Axess web site and enter the web site of any third party. We would like to point out that we have no influence whatsoever over the design and content of such web sites and can accept no responsibility for them.